Center Seal Bag Making Machine Video(FK-FSC-350) - HCI Converting Equipment Co., Ltd.
FK-FSC Economical Type Center Seal Bag Making Machine is a specialized machine for producing center seal bag. Simplified design, easy to operate. 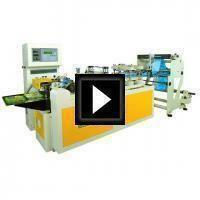 This model is the most economical investment for center seal bag production.